So much for blogging daily – this year's mistletoe supply business is keeping me even busier than usual, so am finding it difficult to blog – and to keep up with emails. There's a big backlog again – so apols, as usual for this time of year, if you've been writing to me and haven't yet had a reply. Was working with Reg Farmer today – and we keep meeting people who saw us both on TV (BBC Countryfile – see it on iPlayer) yesterday… This recognition, though welcome at first, can become a little tiresome after a while! A dark, wet, and windy morning in a field near Tenbury Wells. Surrounded by piles of cut mistletoe, trussed up in round bundles. Yes, it's the first of this year's mistletoe auctions – and yes, the scene is much the same as previous years. So much so that I've not even bothered to get the camera out of the car – the pic I've put here is from last year. The familiarity is actually very reassuring – as we need this auction to continue unaltered for so many reasons – local traditions, local economy, putting Tenbury Wells on the map, helping manage the mistletoe infestations in old apple trees and, not least, bringing pleasure to so many people. That pleasure isn't just a few kisses at the end of the retail trail – it starts here, today, where media interest is high and newspapers and TV rush to get pictures of mistletoe to show that Christmas is coming, and that we Brits are still eccentric enough to continue with this ancient seasonal trade. The amount of stock today is relatively low – but that's normal for the first sale of the season. Buyers are here from all over – Suffolk in the east to Ireland in the west. Everyone wants their genuine English Mistletoe from Tenbury. Condition is good – loads of berries – though colour is still a little opaque in some bunches – should be more translucent/pearlescent in a week or so. Prices fairly good – about £18 per lot. That may sound cheap compared to retail mistletoe – but there's a lot of wastage in those bundles, and their shelf-life may be short (some may have been harvested a week or so ago) so there needs to be quite a mark-up to make a profit after transport and processing. The wholesale price also barely makes a profit for the seller – who has to harvest, bundle it up and bring it here form across the Herefordshire & Worcestershire areas – there are long-term issues here for the sustainability of the trade – but more about that another time. News photographers from several papers and agencies – so should get some coverage in the next few days. The dominant media presence today is BBC TV Countryfile who are filming the auctions and later on, some harvesting. A long day for them – starting at 0730 at the auctions and not leaving the orchard location until after 1600. Their presenter today is James Wong, best-known for his recent Grow Your Own Drugs series. (I'll post some info on his GYO Drugs Christmas special, which features mistletoe, soon). Today's filming is for this Sunday's programme – 1900 on BBC 1 I think. For an update, and overview, click here for a pdf news release. Hope to post some proper mistletoe news this week – have been a little pre-occupied with practical matters in last few days – harvesting mistletoe in the rain (soft ground is really annoying when you're standing on a ladder), packaging up odd mistletoe orders (which colour ribbon goes with which order?) and generally answering (or ignoring, sorry, have been busy) the phone and emails. Mistletoe silly season really has begun now. Spent today fielding many mistletoe enquiries – mostly media-related. Early start (1.5 hour drive) at Tenbury High School for 0845 to talk mistletoe at the Lower School assembly (back tomorrow for the Upper School, which will include this year's Mistletoe Queen etc). Followed by pow-wow on Mistletoe Festival related matters at the school. And then into Tenbury town to talk TEME mistletoe business – ranging from where the stock is coming from, to where we're sourcing the mailing boxes this season, and should we change the sizes? All alongside hurried email discussions about mistletoe promotions next week (more on those another time). Plus going out and checking venues for some BBC filming of mistletoe harvesting. Phone messages – at home and on mobile – from newspapers and agencies looking for info on sales this year, and can they have pictures from last year. Emails re the same thing. Dispatching mail-order mistletoe too – and finding we need to order more parcel tape. And an early (season) radio interview for BBC Radio Cumbria. So, not back home again until late afternoon, where (some of) TEME's mailing boxes for this season have arrived – so that's one less worry. Busy, and interesting, day so shouldn't grumble. But it was a beautiful sunny day, with those lovely long autumn shadows, and the orchard we surveyed for the BBC venue was crying out for several hours of (relatively relaxing) mistletoe photography. 'Marchandes de Gui', aka Mistletoe Sellers, were once a common New Year phenomenon in France. And there are several famous portraits of them – including efforts by Picasso and Kirchner. Plus a lot of sepia postcard photos of the real thing. I'll post examples of several in the run-up to Christmas, starting with this 1907 portrait by Adrien Barrere – available in poster format at AllPosters. Attended a Gloucestershire Biodiversity Action Plan Partnership workshop today, at the Gloucester Rugby ground in Kingsholm. One of the workshop sessions involved an exercise looking at restoring habitat continuity – using old orchards, and the biodiversity value of old orchards, as an example. David Bullock, Head of Nature Conservation at the National Trust , had set us a light-hearted exercise centred on 'Ambridge' (home of the Archers) where orchard habitats had become fragmented in the modern agricultural landscape. Each orchard area supported a different assemblage of orchard-dependent species, including (naturally) mistletoe, and two of the rare insects associated with mistletoe – the Mistletoe Weevil (Ixapion variegatum) and the Mistletoe Marble Moth (Celypha woodiana). This little band of insects means that mistletoe gives extra value, in biodiversity terms, wherever it occurs, providing habitat for species not found anywhere else. All are considered rare and, in recognition of this, the Mistletoe Marble Moth has recently (2008) been given Priority Status in the UK BAP. This, in turn, means that efforts are now being made to document its occurrence and work out conservation needs, and this has been led, over the last year or so, by the charity Butterfly Conservation. This picture (click to enlarge) was taken at one of their 'how-to-spot-the-mistletoe-moth' training days earlier this year. Note the use of binoculars (all looking in different directions!) – this is the only way to spot the larval leaf-mines in mistletoe high up in a tree. For more about the Mistletoe Moth Action Plan click here. Talking of the Tenbury events, here's a pic showing the rather odd scene just before the auctions begin – would-be buyers, having chosen their favoured lots, knee-deep in mistletoe next to them waiting for bidding to start. Available in greeting card form at Cafepress (shipped from the US) or from Mistletoe Design (shipped from UK, in a slightly different format). Is this the most over-priced mistletoe on the web? 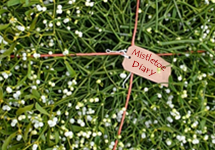 Have just been reviewing online mistletoe sellers – to see what's on offer this season. Usual suspects – TEME in Tenbury (the original online mistletoe sellers, in whom I have to declare an interest), InterRose in Suffolk (who buy from the Tenbury Auctions) plus some Ebay sellers. So far, so very similar to previous years. But one of the Ebay sellers caught my attention more than the others – initially because they are using two of my photos, nicked (without acknowledgement) from the TEME website. And then, on closer inspection, it was the price that drew me in. One of their lots is a Buy-it-Now at £119.0, plus 10.99 shipping, just for a natural bough of mistletoe. That's amazing. Who (if anyone) would buy online at that price? And if they do, will they send me my cut, as it'll be my picture wot sold it? Off to see my mother today – as it’s her 80th birthday. So, Happy Birthday Mum! What has this got to do with mistletoe? Well, up until a couple of years ago there was a very old apple tree in her garden, festooned with large mistletoe growths. It was magnificent – a source of wonder to friends and neighbours, a local landmark (clocked, independently of me, by botanical surveyors in the 1990s national mistletoe survey), a regular supplier of seasonal gifts and, for me, a constant living laboratory where I could see and photograph mistletoe’s life-cycle. This pic is just a part of it (obviously). And then it died. Well, the apple tree died, swiftly followed by the mistletoe. And the reason it died? There was too much mistletoe. I had got too carried away with its longevity (I had known the tree all my 40-something years) and assumed, despite really knowing better, that this mistletoe-laden tree would go on and on. But too much mistletoe, on a small garden apple tree (pic shows a different example), will become a problem. Not just a problem – it will become life-threatening for the tree – which will become water-stressed in summer, and top-heavy in winter storms. The key to mistletoe longevity, just as in human longevity, is active intervention. Replacement hips, asthma inhalers etc help with the older human generation (80 is ‘young’ these days) – and the mistletoe equivalent? Just pruning – but regular, and considered, pruning. Easy! And yet so difficult. The old apple orchards of Britain’s mistletoe country are struggling – and many of the oldest ones are overgrown with mistletoe. Reasons are varied – but include simple, but often benign, neglect. People don’t seem to understand that they need to manage the mistletoe to sustain both tree and mistletoe. I’ve discussed this in this blog before – and rather than repeat it all I’ll just add a link to a summary paper I compiled for apple day celebrations back in October. You can download the pdf here. In Britain mistletoe management in apple orchards has always been an informal thing – you either do it or you don’t. But over in France there is a long tradition of legally-enforced mistletoe management – and orchard owners were once obliged to cut the mistletoe out each year. The legal framework for this still exists, and, under legislation passed in 2000, the local prefecture can still issue local mistletoe management orders where deemed necessary. This picture (click to enlarge) shows mistletoe management activity in Normandy in the 1930s (they boxed it up to sell to us Brits at Christmas) – and is available in greeting card format from the Mistletoe Design Store here, or, if you’re in the US, from Mistletoe Design at CafePress here.